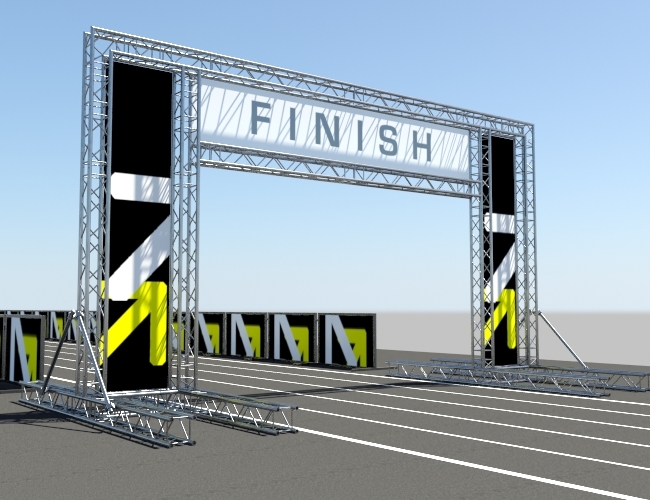 One of the hottest sports trends today is utilizing aluminum truss for finish lines. Heavy, awkward scaffolding or easily-tipped tripods and poles are a thing of the past. Lightweight aluminum trussing can run circles around the competition, providing great spanning capability while securely accommodating banners, time clocks and more. Fast assembly and tear down means you can beat the clock when relocating the truss structure from a start location to the finish location. Transport is less costly due to its light weight and small pieces. And the low maintenance aluminum finish stands up to the harshest outdoor environments. 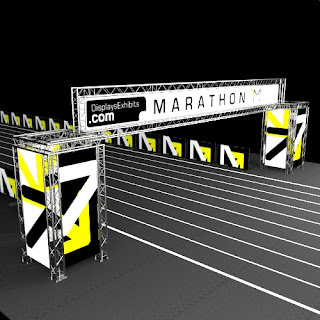 Adding multi-sided banner areas to the finish line is a great way to display sponsor logos and race information. Uneven terrain? No problem with our leveling pods that provide incremental adjustment for stability on uneven surfaces. From fun runs to marathons, truss finish lines hit the mark. Short lengths allows for flexibility when extending or shortening your structure - simply add or remove pieces to extend or decrease the span. Change from complex to simple finish lines by reconfiguring a standard stockpile of truss inventory. 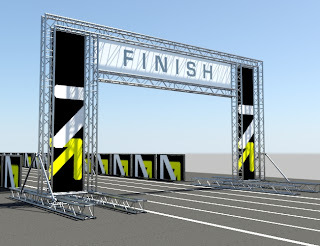 We’ll help you custom design your finish line truss structure with our free AutoCAD design services. Give us a call at 888-804-0042 or email a sketch. We’ll need your budget and required date. Or browse our stock finish line truss kits, guaranteed in stock and ready to go.